1. Place the ingredients in a large bowl. Use a mixing machine and whip the ingredients until the icing is light and fluffy. Spread the icing on fully-cooled cupcakes. I personally just sprinkle a very light bit of powdered sugar on top. 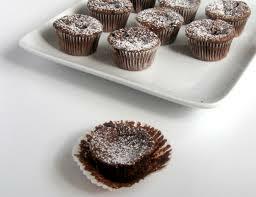 Preheat oven to 350° F. Line a six-count cupcake pan with cupcake liners. In a bowl, using a mixing machine, mix together the eggs, coconut oil, cocoa powder, honey, vanilla, and cream of tartar until combined. Add baking soda and salt. Mix until combined again. Immediately pour the batter into the cupcake liners, about half full. Bake for 15 to 26 minutes until the tops are firm to the touch and a toothpick comes out clean. Place the ingredients in a large bowl. Use a mixing machine and whip the ingredients until the icing is light and fluffy. Spread the icing on fully-cooled cupcakes. Notes: Increase the amount of raw honey if you want it to be sweeter. I tend to prefer my stuff on the less sweet side.